I have had so much creating this! It is perfect for 1st or 2nd Grade (Grade 1 in Australia) and is a fun and engaging way to bring Pirates into Maths! 19 page booklet available from my TpT site! Have fun!!! Love the Pirate Math. 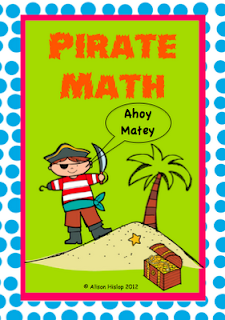 I also have a pirate themed math set on TpT! I have given your blog the One Lovely Blog Award! Check out my blog for details!